Arthur Ralph "Buck" Minerd was born on March 23, 1896 at Atlas near Uniontown, Fayette County, PA, the son of Charles B. and Ada (Tressler) Minerd. Arthur badly injured his hand as a teenager, requiring medical care. In a January 1912 letter by his sister Bertha Pringle, she wrote: "Arthur's hand is a doing fine. The Dr. dresses it every other day." As an adult, he stood 5 feet, 11½ inches tall. Arthur was married at least four times. His first bride was Katherine Moore (1895- ? ), also spelled "Kathryn," daughter of Leander and Agnes (Miller) Moore of Herbert, Fayette County. They tied the knot in a ceremony at New Salem near Uniontown, on Sept. 21, 1916, when he was age 20. On their marriage license application, Katherine claimed to be age 21. From 1916 to 1919, Arthur lived at a number of coal mining towns in and around Uniontown, an indication of how scarce or short-lived jobs were at that time. His residences included Searights, Hopwood, Mount Sterling, Plummer, Vances Mill, High House, Revere, Puritan, Masontown and Martin, all in Fayette County. Arthur registered for the World War I military draft in 1918, and stated his occupation as a a coal hauler for the Taylor Coal & Coke Company of Searights. On the registration card, perhaps referring to his childhood injury, he wrote that the first finger on his right hand was deformed. He also noted "Wife pregnant." Arthur filed for divorce in Fayette County, with the news printed in the June 24, 1919 edition of the Pittsburgh Press. He claimed that she was "guilty of misconduct with persons both known and unknown by the husband" involving " prominent Masontown men." By 1920, he had migrated to Paw Paw near Fairmont, Marion County, WV. There, he was a driver in a local coal mine and boarded with the family of William H. and Ethel E. Hixon. He disclosed to the census taker in early January 1920 that he was divorced. On Jan. 19, 1920, when he was age 23, Arthur was united in marriage with his second wife, 17-year-old Elizabeth Posten (1902- ? ), the daughter of Augustus and Sarah J. Posten, also known as "Hannah." The wedding took place in Fairmont, by the hand of Rev. Robert J. Yoak. At the time, despite living in Fairmont, Arthur declared that his permanent home was in the mining town of Leckrone, Fayette County, and that Elizabeth worked as a clerk in a Fairmont notions store. The couple are believed to have produced these known children -- Thomas "Hershel" Minerd, Andrew Hershel Minerd, Betty Minerd and Jennie Minerd. This all needs to be confirmed. Unfortunately, their marriage did not last. Circa 1937-1938, at the death of her mother, they lived in separate places, with Elizabeth making her home in Detroit. She was still in Detroit in 1948 when her son Thomas was working there as a truck driver. By 1963, she was back in Uniontown. Circa 1940, when the federal census count was made, Arthur lived under the roof of his married sister and brother in law, Daisy and James Predilla, in Masontown. At that time, he earned a living as a road construction laborer. By 1941, he was married to Goldie Clark (March 24, 1924-2008) and they produced a son, Arthur Eugene Minerd. At the age of 46, when registering for the World War II draft, he stated that Adam Clark of Masontown would always know his address. At the time, Arthur worked for James Amsley at Grays Landing, Fayette County. Goldie was injured in an automobile accident in October 1944 when she claimed her husband was "hogging" the centerline while driving along Jacobs Ferry Road. Although receiving lacerations of the forehead, hand and knee, she was treated and returned home. Then by 1946, Arthur married for the final time to Audrey Dolores Barnhart (Aug. 25, 1923-2003), daughter of Daniel and Ida Mae Barnhart of Uniontown. They produced two sons, Mark Maschil Minerd and Maxwell "Max" Minerd. During the 1950s, Arthur and family lived at Rocks Works near Masontown, Fayette County. 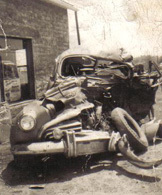 Tragedy struck on May 27, 1952, when Arthur and his nephew William Minerd, age 20, were killed in an automobile accident. (William was the son of Harry and Mary [Blair] Minerd.) The men were on their way to work on the Robert Donley farm near Greensboro. The Uniontown Morning Herald said that in a thick fog, their car "crashed headon into a heavy coal truck on Route 88 at the outskirts of Greensboro... The impact was so great that the Minerd car was demolished." The news also was published in the Pittsburgh Press, Kane Republican, Somerset Daily American and Monongahela Daily Republican. Dolores outlived her husband by more than five decades. Sadly, son Max suffered from heart trouble, was in and out of the Uniontown Hospital circa 1956 and died at age eight. Son Andrew also is believed to have passed away at a young age. Circa 1966, at the death of her mother, she lived in West Leisenring. She married again, to her stepson Thomas Hershel Minerd (see below) and thence to (?) Poole. The third husband brought five adult children to the marriage -- Loretta Poole, Rachel Poole, Richard Poole, Cynthia Hall and Melissa Slivka. She made her home for many years in West Leisenring and supported herself circa 1976 as a bus driver for the Connellsville Area School District. In 1994, she and her children came to the Minerd-Miner Reunion held at Kingwood, Somerset County, PA.
Dolores passed away at the age of 80 on Dec. 6, 2003. Burial was in Fairview Cemetery in Masontown, with Pastor James Valentin preaching the funeral service. Former wife Goldie married again to (?) Windley and spent her final years in Rices Landing. She died on Feb. 10, 2008 with an obituary in the Uniontown Herald-Standard. She rests for all time in the Fairview Church of the Brethren Cemetery in Masontown. Son Thomas "Hershel" Minerd (1920-1963) -- born Herschel David Minerd -- was born on Nov. 5, 1920, in Uniontown, the son of Arthur and Elizabeth (Posten) Minerd. He was a construction worker and truck driver, living in Detroit (1948) and Chicago (1952) before returning to Uniontown. Evidence suggests that he did not have much of a relationship with his father, declaring the father's whereabouts as "unknown" in 1948. Hershel married or was in a relationship with Marjorie Herrington (Feb. 7, 1926-1973), daughter of Anna Harrington. They produced had one known son, Craig Minerd. On Aug. 7, 1948, at the age of 27, he was united in wedlock with telephone operator Rosella "Bernadine" DuBois (Feb. 1, 1926-2015), daughter of Charles and May (Wayrynen) DuBois of Detroit. Their wedding was held in Steuben County, IN on Aug. 7, 1948, officiated by justice of the peace Conn H.L. Smith.. They bore two known children, Diana Lorraine Yurgalonis and Eric James Minerd. The couple separated sometime before their daughter's birth in June 1954. Later, Hershel married his widowed young step-mother, Audrey Dolores (Barnhart) Minerd (1923-2003). They are thought to have had these children, all needing to be confirmed -- Matthew Minerd, Timothy Paul Minerd, Thomas Minerd, Joseph Minerd, Leon Minerd, Tammy Hall and Pamela McCracken. Circa 1963, the family lived at Mt. Braddock near Uniontown. Former wife or partner Marjorie married again to Abraham "Abe" Milhem ( ? -1996) and lived in Detroit. Their offspring were Arlene Lockard, Marilyn McIntyre, Richard Milhem, Jeffery Milhem, Bruce Milhem and Roger Milhem. Sadly, Marjorie died at the age of 47 on Oct. 13, 1973, with burial in Woodmere Cemetery and an obituary in the Detroit Free Press. Abe survived her by 23 years. He died on March 26, 1996, with an obituary printed in the Free Press naming Craig Minerd as a son. Son Craig Minerd ( ? - ? ) is believed to dwell in Southern California. Son Eric James Minerd married Brenda. They have lived in Wyandotte, MI. Daughter Diana Lorraine Minerd married George Yurgalonis, son of George and Lenora L. Yurgalonis. Son Matthew Minerd ( ? -living) was born in (?). On May 6, 1976, he married Roxanne ( ? -living). The couple had children Leon "Lonnie" Minerd and Danielle Minerd. Matthew and Lonnie met the founder of this website in the 1990s at the Calvary Methodist Church in Uniontown, celebrating the church's centennial anniversary. Roxanne has been employed by Anova Healthcare Services as a caregiver. Son Timothy Paul Minerd (1955-living) was born on April 22, 1955. He married Rhonda Marie Russell ( ? -living), daughter of George Orlin and Emma Grace (Jose) Russell Sr. of Hopwood. They were wed in July 1974 in a ceremony in Garrett County, MD with the news published and Rhonda pictured in the Uniontown Morning Herald. At one time he worked as a laborer and automobile mechanic. After a divorce, he married his brother's ex-wife Brenda (Stillwagon) Minerd in 1983. They first lived in Lemont Furnace and Coolspring before relocating to Fairchance. They were the parents of Paula Klepsky and Tiffany Shelby Minerd. The couple divorced. Brenda has been employed by the County of Fayette as second deputy treasurer with involvement in small games and dog licensing matters. Granddaughter Paula Minerd married Justin Klepsky. They dwell in Scottdale and are the parents of Geno Klepsky. Granddaughter Tiffany Shelby Minerd (1987-2019) was born on June 30, 1987 in Garrett County, MD. She bore a daughter, Karma Abel. Said the Uniontown Herald-Standard, she "enjoyed drawing, art and taking care of her daughter, who was her world." In 2019, she made a home in Hopwood. Tragedy instantly snuffed out her life at the age of 31 on April 4, 2019. While driving in the early morning hours on East Main Street in South Union Township, she was killed when the vehicle she was driving crashed into "a tree, a fence, the porch of one home and then came to rest against a second house," reported Pittsburgh television station KDKA-TV. Rev. Joe Ritz officiated at her funeral service. Son Thomas Minerd married Cindy ( ? - ? ) and had four children -- Mandi Minerd, Brandi Minerd, Bruce Minerd and Candi Minerd. His home in 2019 was in Shoaf, Fayette County. Son Joseph Andrew Minerd was a carpenter who resided in Lemont Furnace. He was twice married. His first wife was Brenda Stillwagon ( ? -living), daughter of Edna Stillwagon. After a divorce, he was joined in marriage with his brother's ex-wife, Rhonda Marie (Russell) Minerd ( ? - ? ), and they were wed on Feb. 28, 1983 in Cumberland, Allegany County, MD. The Minerds had two daughters, April Minerd and Emily Minerd. For many years, Rhonda served as a notary public in the community of Lemont Furnace. Later in the 1980s, Joseph's home was in West Leisenring and in 2019 was in Uniontown. Daughter Tammy Minerd married James "Jay" Hall. Their children are Crystal Hall, Jessica Hall and Jay Hall. They dwell in Smithfield. Son Leon Minerd married Rita. Their three children are Timothy Minerd, Leon Minerd Jr. and Jessie Wotring. The couple divorced. Leon wedded Betty and Rita married (?) Zerechex. Leon lived in Smithfield in 2019. Granddaughter Jessie Minerd married Christopher Wotring, son of Charles and Doris Wotring. Their home in 2014 was in Reedsville, Preston County, WV. They have two daughters, Audrey Marie Wotring and Magdalyn Wotring. Daughter Pamela Minerd was united in marriage with Patrick "Pat" McCracken. They have one known daughter, Jamie McCracken. Pamela became a pastor and is popularly known as "Minerd Bell." Their home is in Farmington. Daughter Betty Minerd ( ? - ? ) was born in (?). In 1952, she and her sister Jennie lived in Johnstown, Cambria County and were mentioned in the Uniontown newspaper obituary of their father. Daughter Jennie Minerd ( ? - ? ) was born in (?). Circa 1952, she dwelled with her sister Betty in Johnstown, Cambria County and and were named in their father's obituary in the Uniontown newspaper. Son Arthur "Eugene" Minerd (1941-1997) was born on Sept. 9, 1941 in Masontown, the son of Arthur and Goldie (Clark) Minerd. At the age of 11, when his father was killed, Eugene made a home in Masontown. He resided in Florida in 1959, when he was age 18. Arthur was married. The identify of his wife is not yet known. Circa 1990, he made a home in Columbus, Franklin County, OH at 1181 Minnesota Avenue. By 1993, he had relocated back to Masontown, with an address of 305 South Water Street. Son Mark Maschil Minerd (1946-2019) was born on Nov. 15, 1946 in Uniontown. He was five-and-a-half years old when his father was killed. Mark served in the U.S. Marine Corps during the Vietnam War in 1965 and took basic training at Camp Lejeune, NC. He was assigned to the 2nd Battalion, 5th Marines. He was wounded and received two Purple Heart medals as well as a Bronze Star. He belonged to the Gold Wings. He married Donna Raye Matthews (Aug. 21, 1947-2014), daughter of Charles R. and MaryEllen Ruth "Peggy" (Hall) Matthews of Mount Independence near Uniontown. They lived in Lemont Furnace and had three known children, Rachelle Renee Minerd, Charity Dawn Minerd and Shawn Maschil Minerd. When Rachelle was four years old, she was pictured in the Uniontown Morning Herald birthdays section. Circa 1974, Mark served as a member of the police force of Newell Borough. Mark and his family attended the 1994 Minerd-Miner Reunion and presented the founder of this website with a typed booklet spelling out who's who among some of the family branches. Sadly, Donna passed away at their home in Smithfield at the age of 66 on April 30, 2014. Burial was in Mt. Auburn Cemetery in Dunbar, with Rev. Paul Eckenrode officiating at the funeral. An obituary was printed in the Connellsville Daily Courier. Mark outlived his wife by almost five years. He died at the age of 72 on Jan. 27, 2019. His remains were interred in Mt. Auburn Cemetery, with Rev. Branden T. Robertson leading the funeral service. Obituaries were published in the Daily Courier and the Uniontown Herald Standard. Daughter Rachelle Renee Minerd (1969- ? ) was born in March 1969. At her sixth birthday, she was pictured in the Uniontown Evening Standard. On Nov. 12, 1988, when she was 19 years of age, Rachelle married John Fitzgerald Martin ( ? - ? ). Their wedding was held in Fairfax, VA. They live in Front Royal, VA and are the parents of Cody Martin and Cory Martin. Grandson Cody Martin married Amber. Grandson Cory Martin wedded Kayla. Daughter Charity Dawn Minerd (1975- ? ) was born in February 1975. She wedded Richard Fabery ( ? - ? ). Their children are Kyle Fabery, Jade Fabery, Jetta Fabery, Jayne Fabery and Rico Fabery. The Faberys make a home in Uniontown. Grandson Kyle Fabery and Tia are the parents of Aubri Fabery. Son Shawn Maschil Minerd ( ? - ? ) was born in (?). On March 4, 2009, in nuptials held in Virginia Beach, VA, he wedded Kristan Marie McIntyre ( ? - ? ). Later, he wedded Nicole. They dwell in Uniontown. Son Maxwell "Max" Minerd (? -1957?) was born in (?). Max suffered from poor health as a boy and circa 1956 was in and out of the Uniontown Hospital. Evidence suggests that he passed away in Shelby, Richland County, OH on April 11, 1957. His burial site is unknown. This needs to be confirmed.